Boardwalk Empire recapper Seth Colter Walls is filling in for Joanna Robinson this week. Does a 63-minute episode make up for FX having kept us on tenterhooks during a one-week hiatus? If “You Are My Sunshine” feels not quite up to that rather large task, blame it on its next-to-last-episode positioning. Ditto the fact that the episode follows hard on the heels of one in which Clay Morrow met Mr. Mayhem. Still, the episode forwarded an impressive number of plots, with only a bit of timing-related cheating needed to keep all the climaxes in reserve for the finale next week. Here’s what we learned in the meantime. 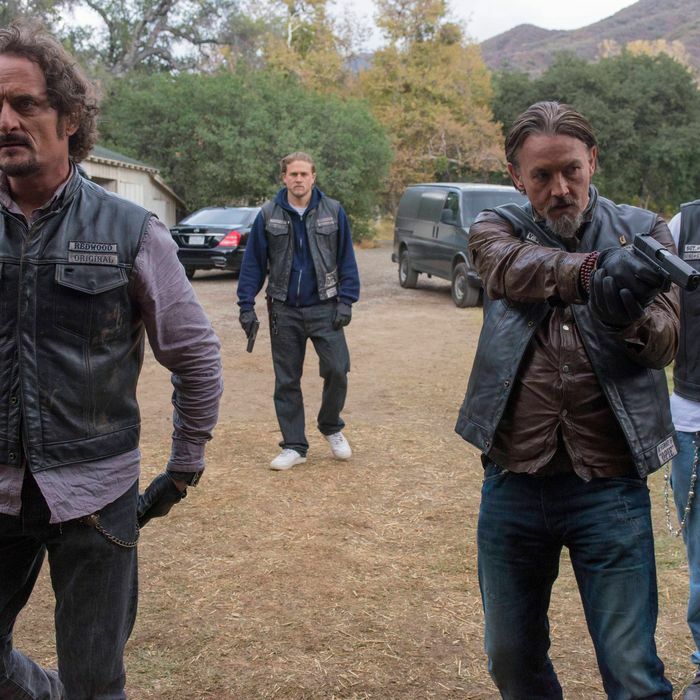 All season long, Chibs has been at pains to inform Jax that the Kings won’t cotton to doing business with August Marks, or any African-American gangster you could name. And yet, in this episode, the Prez figures out how to make Connor an offer he can’t refuse: Once the Sons kill off most of the remaining Irish soldiers in America, their next play is to act like they’ll hand over Connor himself to the Chinese, as recompense for Galen’s casually psychotic use of Chinese soldiers for target practice a couple episodes back. “Well, Jackie Boy, you just advanced race relations in Ireland by 50 years,” the VP admits. “And half a million dollars,” Tig notes. Whatever works! Now the club just has to deal with the “unraveling” that is going on up in Oakland. Right now, they only know that hitting the Chinese will upset the balance. But that’s just the first among several future race-related migraines Jax will soon have to deal with. The Mayans aren’t too happy about the power vacuum created by the Sons’ exit from guns — let alone the club’s alliance with Marks. And so Marcus Alvarez puts pressure on Nero’s Byz Lats to make an alliance. Nero — well off the street at the moment (he’s even wearing a sweater, c’mon) — gets a wake-up call from a soldier early on in the episode, and eventually meets with Alvarez, who tells him that the coming war is going to be “brown and yellow against black and white.” Great. And that’s before Nero learns that Jax straight-up lied to his face, regarding the death of the mother of the kid who shot up the school. I was also sort of surprised that Bobby didn’t detect anything off with Tara. He missed her phone conversation with the D.A. Tyne Patterson, fair enough; but even after waking up, his radar was way off. He told Tara the whole club loved her, and got a terse, not-at-all-convincing smile in return. Oh well, time to drink some more! Tara’s machinations are pretty impressive in this episode. She also benefits from quite a bit of luck: lackadaisical staff work at the cabin, in which club members are mostly focused on the size of Bobby’s manhood; the fact that Gemma runs into the D.A. at the hospital (but fails to immediately smell a rat). The speech that Tara makes to Abel, after pulling a gun on Wayne and Wendy, at the episode’s end, proves good enough to get the kid to ignore Wendy’s “I’m your real mom” blurt-out. But if she’s made the “hard decision” to keep her kids safe, why does she pull up at a cheap motel, instead of at Patterson’s door? Part of the reason why is revealed earlier, at the cabin, when she impulsively runs to Jax and says she’s “sorry” (he thinks for the miscarriage ruse), just before a clench in her upper body and face reminds her that she’s supposed to get out of Dodge. But either she’s a mommy who makes “hard decisions” or she isn’t. We’ll find out about her choice in the finale, presumably, but I didn’t quite buy how the show put off the revelation in this hour. Once she’s turning a gun on Wayne, I expect Tara to know what her next move is. One of the most fascinating aspects of this season is the way that its constantly scheming main players have been forced to parse the letter (and spirit) of various agreements, in order to see whether further retaliation is required. Jax thinks that taking out the Irish will get Happy back from the Chinese, but is informed that vengeance is really about getting to do it yourself. Finally, Jax’s weak attempt at rapprochement with Tara at the cabin falls far short of what she deserves. Understandably, the line “We’ll figure all this out after your trial” is not one that any self-respecting Old Lady wants to hear. In a romantic union, just as in business dealings, the understanding of what constitutes a promise depends on a mutually acceptable definition of fidelity. At least Marks agrees that, win or lose with the Irish, Jax has earned back Tig’s life. Nero has been itching to get out from under the club’s thumb for a while now. But the way he spat out the phrase “yeah, I’m sweet” in response to Lyla’s interpretation of his Gemma romancing, suggests that the visit from his crew member had its intended effect. Nero doesn’t want to be called sweet. A close-up shot, at episode’s end, of Nero’s open hand next to Jax’s mournful head — so very nearly a fist, and so easily turned into one — is great, and full of portent. For the moment, Nero allows it to remain a consoling force, if only out of sympathy to Gemma (who has also just lost her grandkids). But there’s one more hour left, this season.